Frozen shoulder or 'Adhesive Capsulitis' as it is also referred to is a common cause of shoulder pain and it is estimated that up to 5% of the population suffer from this debilitating and poorly understood condition. Not all the causes of frozen shoulder are fully understood and it generally comes on slowly and almost unnoticed at first until the pain starts to set in. The shoulder is a complex joint surrounded by muscles and tendons some of which form the rotator cuff. It is when some of these muscles become inflamed and thickened that the shoulder begins to become stiff and painful and can be described as a frozen shoulder. A previous injury or surgery to the shoulder. It is thought that the reduction in movement following the injury or surgery may be the initial stage of frozen shoulder development. A rotator cuff tear or strain. Once again the injury to this group of muscles that control and stabilise the shoulder joint is thought to be part of the potential cause in some cases. Diabetes. It is estimated that up to 20% of diabetic people will suffer from frozen shoulder. Many of you will have probably heard that this is a very painful and potentially long lasting condition. Pain and persistent stiffness are key characteristics of this condition and it may last several years and in some cases never fully recover. It is often described as having 3 or 4 phases by doctors, physiotherapists and osteopaths but these phases are often difficult to distinguish between and the condition is very varied from person to person. It is generally accepted that the first stage is the most painful and the last stage often referred to as the ‘thawing’ phase is when the pain begins to subside and some initial movement begins to return. A GP may prescribe medication for pain relief or even refer you to a hospital for orthopaedic examination and evaluation. Both Physiotherapists and Osteopaths are able to treat frozen shoulder with massage and mobilisation techniques to help reduce pain and increase movement. Heat can be helpful to reduce muscle pain, spasm and tightness. Cold therapy can be useful at managing the pain and inflammation. A shoulder support can provide both support and warmth. A tens machine can be used for pain relief. 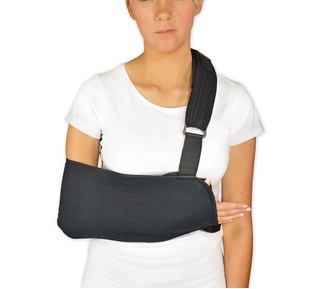 Although you might be tempted to put your arm and shoulder in a sling due to the pain it is not recommended for frozen shoulder. It is better to attempt to keep it gently moving where possible.